In this blog post, I cover a Firefox add-on to show feed based on custom words only with RSS feed reader. 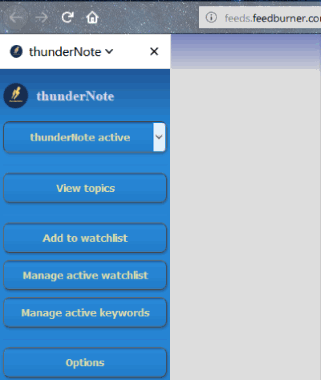 This RSS feed reader add-on is called thunderNote. All you need to do is add the URL of the RSS site in the Add to watchlist section then set the custom time and numbers of days to keep the news in its interface. You can also edit it later. Since this RSS reader displays news content on the basis of keywords, so you have to manage keywords by adding custom words. Thereafter, you will get the updates according to the preference that you have set. The main feature of using RSS reader is that you can get connected with multiple online web content. You can get updates for all those news that are related to your added keywords. In this way, you don’t need to visit the sites again and again. Even if you’re working with other tabs, windows, or browsers, you will get notified about the updates. If you want to disable the notifications, then you can do that too. 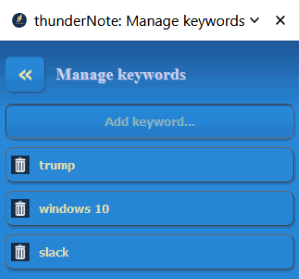 Once you install this Firefox add-on (thunderNote), a layout appears on the left (as shown below) where you can customize the RSS feeds of multiple websites. 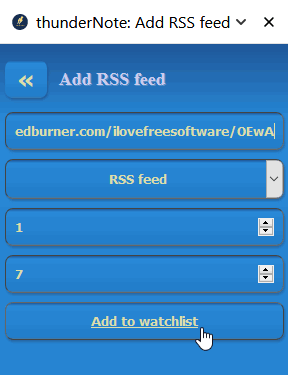 To get the RSS feed updates, you can click on Add on watchlist option in the layout. Then, add the URL of those websites that have RSS feed. As shown in the image below, you can set the maximum age of news to display from (1-356) minutes. Which means, If you set the range of fetching the news as (1) then you will get notified after every 1 minute. Also, you can set the number of days to keep the news in the layout section. The range can be set from (0-119) days where 0 means infinite. When you’re done with the customization of RSS feed then click on Add to watchlist. If you want to add another URL then you can follow the same process again. Also, you can manage this watchlist later even after adding RSS feeds details. The next step is to manage keywords. It is necessary to add keywords related to the subject as it becomes more convenient to read the relevant web content. To do so, you can click on Manage active keywords and write custom words in order to display the RSS feed related to the keywords only. You can add multiple keywords or remove later. After adding keywords and RSS feed URLs, this RSS reader notifies you within the custom period of time. To view the content, you can click on View topic and you will see the only RSS feed that is based on your keywords. 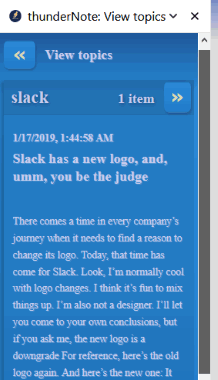 In the image above, I added the word “Slack” as my keyword and it displayed the content from the site having this keyword only. The process is quite easy to get RSS feeds for different sites. If you wish to get RSS feeds for Twitter, YouTube, Instagram, then you may visit this article. Undoubtedly, RSS feeds benefit you to stay updated with all the latest content, blogs or new web feeds. Also, it becomes more convenient to read content in one place rather than visiting different sites from time to time. You may give this add-on a try and stay updated with the latest RSS feeds on the basis of custom words.